When you’re cutting your grass you want to make sure that you have the right equipment to get the job done right. You definitely want to make sure that you have a mulcher that will take care of chopping that grass up fine enough you don’t need to collect it and you don’t need to worry about brown spots. With any of the mulchers in our mulching blade buying guide, you’re going to be off to a great start. Blade Length: How many inches in length is the blade? How much will you be able to cut at one time? Will you be able to get through your yard in a minimal amount of passes? Will your mulching blade work with your current mower? Pieces: What all is included in the set? Do you get everything that you need in order to get started? Are you going to have to actually assemble your mulcher or does it come already put together for you? Fewer pieces could mean less work. 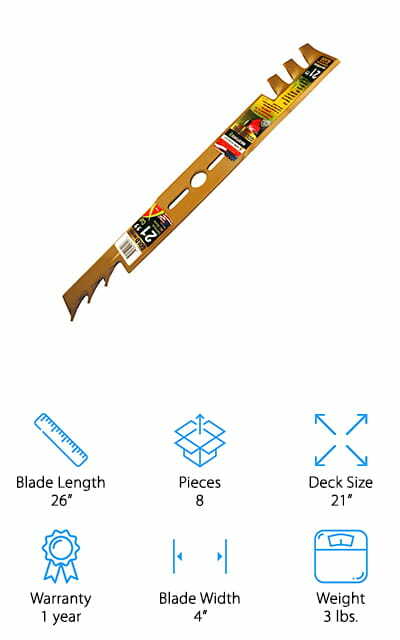 Deck Size: What’s the size of the deck that the mulching blade is going to work with? This is where you need to know a bit about your lawn mower so you can make sure that you have the right fit and you’re going to be able to get started. Warranty: How long is the warranty on the product? Is it going to last a while or are you going to need to be careful? Does the manufacturer back up their product with high quality and know that it’s going to last for you? Blade Width: What’s the width of the blade itself? How far does it stick out from the lawn mower? What’s it going to be able to cut or how much space is it going to take up? You’re definitely going to want to know all of these things. Weight: How much does it weigh? Are you going to be able to still easily use your lawn mower? Are you still going to be able to pick it up and carry it as needed? Can you take it off your mower and put it back easily enough? If you’ve never thought of a mulching blade for your lawn mower before it’s definitely something that you should be thinking about. Any of these blades is going to make things easier for you and keep your yard looking even better too. We’ve found 10 great options and we’ve created a mulching blades review to help you narrow things down for yourself and get the right one. 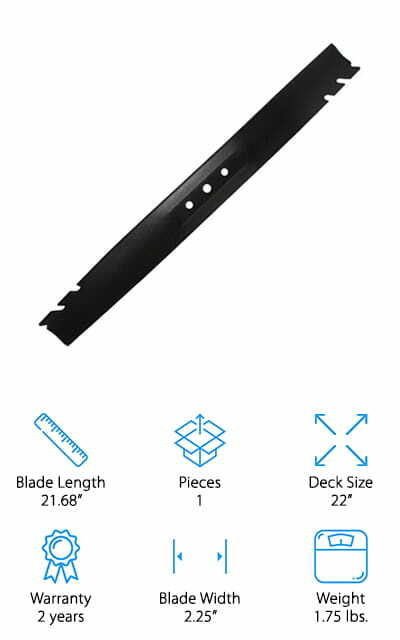 Our top pick, best mulching mower blades are a 3 pack of Gator mulcher blades that will fit 54” decks for lawn mowers like Craftsman, Poulan Pro, and Husqvarna. Austemper heat treated to provide a 20% harder steel product to extend the blade’s life; these blades have a unique design that helps to mulch through grass clippings quickly and easily. Made in the USA, these blades can definitely help you get your yard looking even better while cutting down on the overall work involved for you to get things cleaned up. Great for even wet or longer grass, they can definitely improve the way that you mow your lawn. 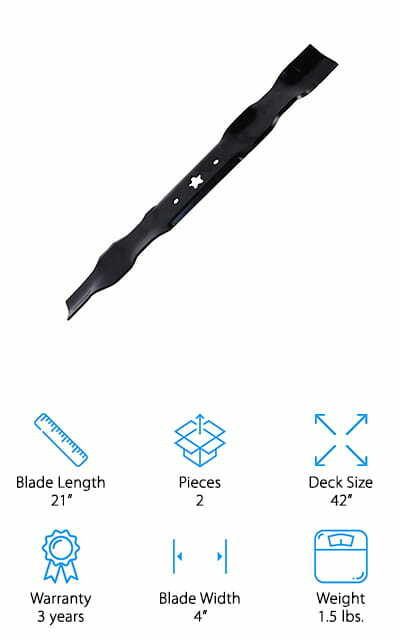 These Oregon Gator mulching blades are easy to attach and easy to sharpen as needed as well, which means you shouldn’t have a problem getting through anything and getting the blades ready to go again in no time when they start to get a little too dull or a little older. Our best cheap mulching blades are a Toro mulcher blade that offers plenty of size to get through your yard quickly (and fit your lawn mower of course) but also is ideal for a range of different lawn mowers. Ideal for Toro branded products, this blade fits well and attaches easily, which will definitely help you to get your yard cut and ready to go in no time at all. It doesn’t even have a problem with wet grass or longer grass if you need to get things cut in a hurry. Just like the original blade that comes with your mower, it definitely provides you with everything you’re looking for and it has no problem with quality either. It helps to pick up clippings and mulch all of the grass that you run through your mower, which is definitely going to make it easier for you to keep things clean. This mulching blade is inexpensive and offers a 90 day warranty for any kind of defects in the materials or the workmanship, which is definitely a benefit you’re going to appreciate. An original equipment part for the MTD brand of mowers, this blade is the best 21 inch mulching blade with a star center for an easy attachment to a number of different mowers. It works on 1995 and newer mowers from the company as well as several Cub Cadet models, Yard-Man mowers and a whole lot more. This blade is lightweight, which makes it easy to move and attach as well as being made with high quality materials. It can be used with even self-propelled mowers and can be sharpened quickly and easily. As you continue to use it you’ll be able to mulch through your yard with no problems at all. This gold metal mulching blade fits 21” cutting mowers and is considered a universal option, which means that it’s capable of working with just about any mower that you may have. That makes it the best lawn mower mulching blades and it’s also made in the USA so you know that it’s high quality and ready for anything. The sharpened cutting teeth provide you with a superior cut and a clean one at that, plus it’s able to provide you with more mulching because of the larger cutting surface. It uses a centrifugal air lift design to chop evenly and has a 1” center hole for a variety of washer sizes. A little heavier than some options, this blade has a straight profile and therefore can be sharpened easily if it starts to get dull or old while you’re using it. It definitely makes a quick cut and provides small clippings that are definitely better on your yard. This mulcher blade is designed to fit a range of different brands of mowers including Husqvarna and Sears brands. It has a dual bevel design that’s made to mulch even better than traditional designs and features a 21” length that’s enough to really get through your yard in less time. It uses a 5 pointed star for the center hole to form the attachment onto your mower and it’s inexpensive, which is a great benefit for anyone who wants to get their yard looking great. 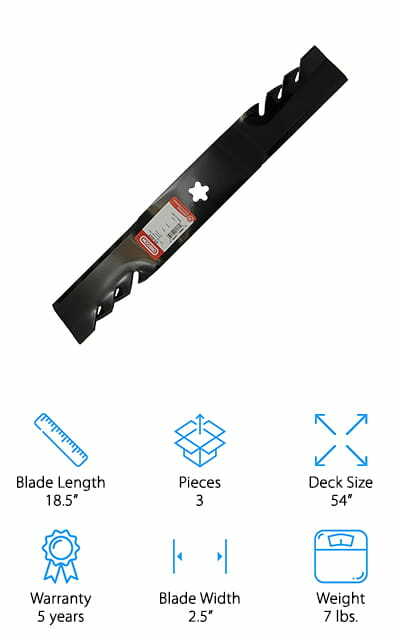 Made in the United States, this blade is lightweight and fits comfortably in a range of 42” mower decks. You’ll actually get 2 blades in the set that can definitely mulch through your yard, turning it into a fine mulch that’s better for everything. 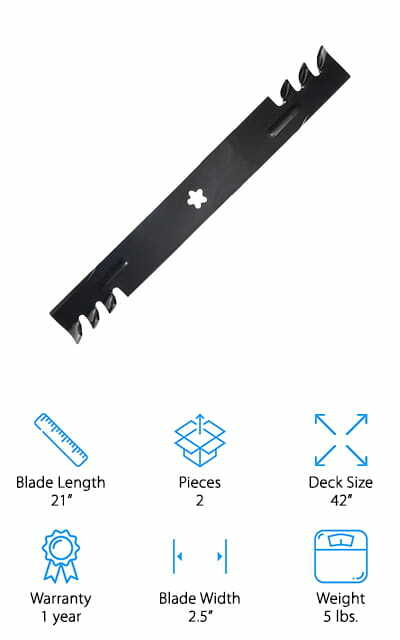 This best 21 mulching blade is designed to fit a range of different mowers, including Craftsman, Poulan, and Honda. It’s made for walk behind mowers and provides better mulching whether you’re looking to bag the pieces or discharge them more efficiently. Made to stay sharp and strong for an extended period, you’ll still have no problem sharpening up this blade to get it working for even longer. It’s even made by a company that’s known for mower blades. These Oregon mulching blades go through a 26 point quality check so you know when it arrives at your house it’s going to be high quality and ready to go. It’s also designed to make sure your yard is going to look great when you’re done with it. At a moderate weight, it’s also simple to install and get started. 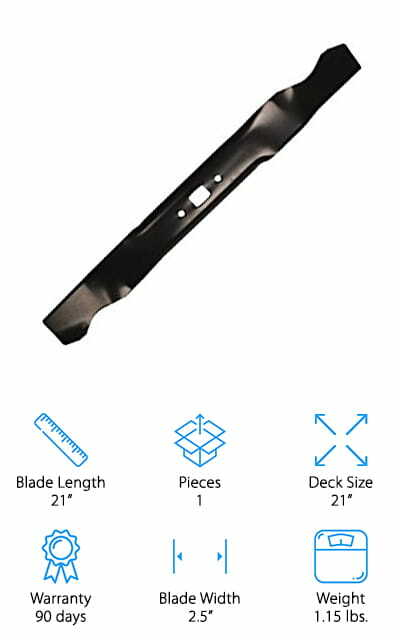 This set of two blades is designed for a 42” deck on Poulan, Husqvarna or Craftsman lawn mowers, though it works on a range of similar models and styles as well. It has a star shaped center to provide accurate attachment and cuts through just about any type of grass with no problem. It’s made in the USA and can even be used for mulching up leaves that fall in your yard. It’s easy enough to sharpen when you need it and holds its edge for a long time. The grass that does get discharged doesn’t clump, even when the grass is wet, so you know that you’re not going to hurt your yard even just mulching it and leaving it out rather than bagging or gathering it yourself. 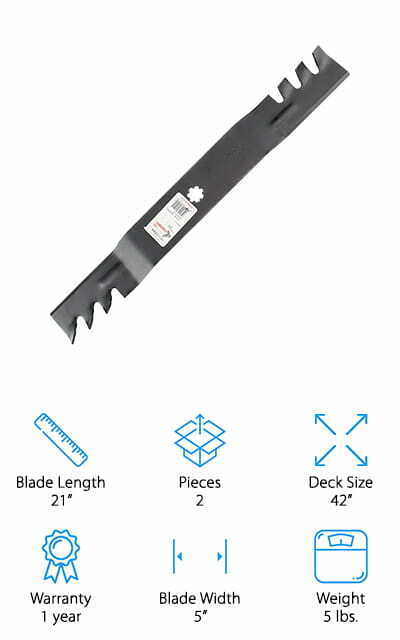 It’s one of the best mulching blades for sale. This set of 2 mulching mower blades is designed to fit several different John Deere tractor models, though it’s also great for other 42” deck lawn mowers. These blades work together within the mower to make sure that you’re cutting through absolutely everything and that you’re not going to have a problem getting a fine mulch that you won’t need to worry about picking up while you work. Designed to stay sharp for a long time, these blades are also easy enough for you to sharpen when it does come time to get them going again. There’s a 7 point star at the center to attach them and there’s a list of compatible John Deere models that you can check. This set of 2 blades is designed for a 42” mower deck so they’re made to be used together. Great for a range of different mowers, including those by AYP, Craftsman, Husqvarna, and Poulan, you can easily check the list to see if your mower is compatible. They offer a 5 pointed star in the center for attachment to your mower deck and are designed to help you mulch up just about anything quickly and easily. They’re inexpensive and made in the USA, which is a great benefit for overall durability and quality. Each 21” blade is sharp enough to cut through the grass with no problem and also provides you with an easy to sharpen edge so as they start to get older you’ll still have no problem getting them to work for you and getting them back in shape. Here you’re getting a set of 21” mower blades that are made to fit a John Deere tractor of a range of different sizes. Made for a 42” deck (and to be used together) these blades are sharp and ready to go as soon as you get them. If they start to get a little dull you’ll have no problem getting them back in shape to get going again. They’re lightweight and have a 7 pointed star shape that helps attach them to the lawn mower you need. Each blade helps you mulch grass (including wet grass) and they can get through leaves as well, which is an important feature when it gets to fall and the leaves start dropping just about everywhere.